Models, corporate branding, product launch aids. Our team creates original and technological magic presentations to highlight your products, logo, partners, actions or goodies, in an innovative and surprising way. The combination of world-class sleight of hand magic and technology allows us to convey any promotional message you desire. We don’t just surprise your customers – we make sure they never forget you!. Not looking to communicate a message? No problem – our digital magic can be customised to simply suit the theme of your event, for example an iPad used as a mind reading‘ radiology device’ at a medical convention, or an interactive‘ black hole’ at a science exhibition. The possibilities are endless! Our digital magic is appropriate for all intimate environments; cocktail parties, receptions and dinners, with the magician roving from group to group (or table to table), performing short interactive shows (5-10 minutes). Our performances can also make the perfect addition to your stand at an exhibition or trade show. Here, the magician will be sure to attract the largest crowd in the room, drastically increasing your brand’s visibility. Imagine the magician approaching your future clients by magically presenting your product or services on an iPad, then offering a magic gift to finish!. Digital performances can also be tailored so suit larger groups, even from a stage. Imagine several iPads, creating a giant screen, presenting your new products in a magical and innovative fashion at a customer meeting. Digital magic enables direct, entertaining and customisable communication and can be adapted to suit any event: close up or on stage. This Photo Wall is a completely unique, glamorous, over the top version of an open air photo booth in which guests “become” the theatrics of the evening. 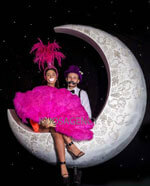 We provides glamorous, tangible “walls” as extraordinary photo sets alongside an open air photo booth. It is perfect for weddings, birthday parties, corporate events or any celebration. 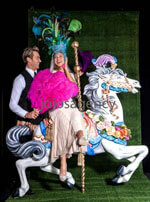 The chosen Photo Wall will become the centrepiece of the event, demanding attention and intrigue from every guest. Forget green screens and superimposed effects; it is the essence of old world glamour, romance and theatrics. We are all about creating an exciting, real time experience. Guests will leave their inhibitions behind and become the theatrics of the evening. So put on a peacock headdress and lounge upon a giant, diamond moon. Side-saddle an exquisite carousel horse, twirling an oversized ostrich feather fan. Surround yourself with climbing roses and romance on an enchanting garden swing. These masterpiece moments will be captured in full glory by the still frame of print, digital media and Facebook. Wall of choice and accompanying props. Including delivery, set up and pack up. Two Photo Wall attendants who will assist in taking photos and manage props. Wide angle lens accompanying state of the art web cam. Onsite, instant, unlimited printing of high quality, glossy prints by DEG sub dye printer. Uploading of images to guest-only online gallery with the option of social media. Studio style set up including two soft boxes streaming continuous white light. Image options include themed graphics/watermarks. 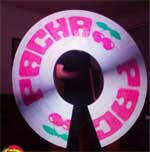 A product line of high tech twirling props based on the persistence of vision that allows to “paint“ pictures, custom graphic, text and logos in the air in a way that audience can perceive it. When your client or guests asks for something that people have never seen before ? a Wow Factor like no other ? you now say YES! This act steps light performance up to the next level of visual and technological amazement. As a component of a bigger show, or as a stand alone act, it, is a performance involving state of the art light equipment ? Electrifying light and Hypnotic movement come together as the best of Sydney?s Twirlers with this state of the art ultra modern technology leave audiences all over Australia speechless. Revealing high definition graphics, we can customize and program, with precision, to display company logos / graphic text and complex imagery, creating a completely specialized performance for your event. Explosive and completely absorbing, this technological dreamscape of unlimited and unimaginable proportions will create sensory overload to blow your audience away. Children and adults alike will be amazed by what these robots can do and will draw a crowd like no other. 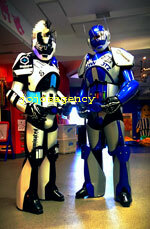 The coolest robots in Australia are here to make your next event ‘Out Of This World. 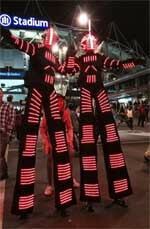 Choose from 1,2 or all 3 of our robots for Roving, Street Entertainment, Product Promotion. Our Robots will walk, talk, dance, play music and attract everyone’s attention while interacting with both children and adults alike. Add your logo, decals, stickers, business name or your message to our Robots for added effect or even have your message broadcast over the our own PA system. They even have their own built in MP3 player so can be used as a mobile DJ. Easy to use – with simple instructions and user friendly buttons. Fully automatic – We can simply switch the booth on and off at the agreed times. So you won’t even need an attendant. Prints two sets of photo strips – one for your guests to take home and the other for you to keep. Photos print quickly – within 14 seconds meaning more photos and fun to be had for all your guests. Professional quality prints – the photo strips have a laminated coating, so they come out dry and won’t get smudged. 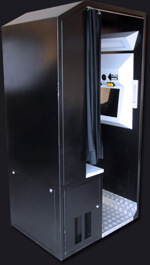 Black and White or Colour – the photobooth can be programmed to either print in colour, black and white or both. Personalised logo or message – your logo or message can be programmed into the booth and it will be displayed in place of the fourth photo on your photo strip. 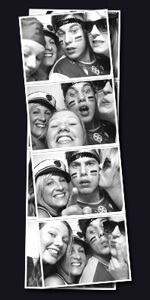 CD of all images taken – we provide you with a CD of images after your event and you’ll be able to re-live fun-times! Strong and easy to transport – the booth is made of steel therefore designed to withstand anyone who dares! It is able to fit through a normal doorway, meaning access to almost any venue. Safe – the booth meets all Australian Safety Standards. Extend your photobooth fun with as many additional hours as you can handle. keepsake of your special event! Adhesive and choice of gold, silver or white pen included. Prop Box-Bring out the wild side in even your most reserved guest with our selection of fun props. Magnets (per hour) -Turn your guests’ memento into a keepsake by adding a magnet to the back of each photostrip. These are sure to find their way to the fridge! Customised booth background -Want a point of difference to your photos? Change our standard white background to something that suits your theme. Attendant (extra per hour) -Let a friendly face assist you and your guests to get the most out of your boothing experience. Great for helping with magnets, props and photo albums. Delivery, set up and removal of booth. Unlimited photos for duration of hire. Black and White or Colour photos. Double photo strips printed in booth in seconds. CD of all photos in high resolution sent to you after the event. Your choice of different backgrounds. Your choice of 3 different software packages. 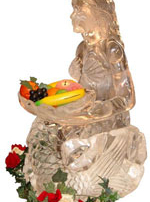 Affordable ice sculptures lasting 6 – 8 Hours.They only look expensive! Ice blocks carved before your eyes for guest/promotional entertainment. Alcohol poured through the center of sculptured ice to chill. Ice bars to serve cocktails to guests. Choose from many themes for corporate functions, weddings and special events. 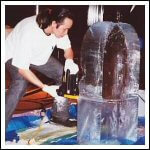 An exhilarating ice sculpture performance will thrill and chill your audience. Let the team at Ice Occasions turn a 140kg block of ice into a work of art in record time as the audience watches in amazement. Performances are accommodated over any time frame indoors or outdoors. Shows can run from one professional sculptor for 45 minutes or multiple carvers throughout the day. The Tattoos and inks are made in Australia with the finest materials. Applied with airbrush or temporary Tatts transfers. On a Trade day you can get your Staff tattooed with you brand name or organizing a fashion parade have the models painted, imagine the talk back. Temporary Tattoos or full body painting for fashion parades and bollywood tatts for weddings and corporate branding to get your message across. Fully hand painted tattoo art. Strictly no permancy or pain. These images are created with a liquid cosmetic and last up to 1 week. Over 2000 designs to choose from. I peel the design off the board (many of the designs are my own artwork, I design them for “The Amazing Raymond”, he prints these detailed images on a special paper, a screen print process using the cosmetic inks. No messy compressors or harsh lighting that may detract from the setting. These give a detailed outline which can’t be achieved with an airbrush. We then hand paint full colour into the design so that they can be unique to the guest “match clothing etc..” Sometimes I enhance with free hand work, glitters, depending on line up waiting. Basically, the image is released quickly, looks real then we enhance to give it the artistry and personal touch. All FDA compliant ingredients, last up to 1 week, may be removed instantly with baby oil or alcohol. 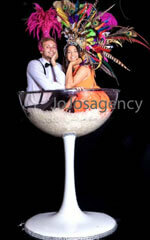 Magic Photos can help make your corporate function or product launch a memorable and fun experience for your clients. By attending your event with our mobile unit and taking photos of your clients, then using Chroma Key technolgy, merge those photos with customised fantasy scenes which are branded with your corporate identity as well as any relevant promotional details. The process only takes a few minutes and clients take away a valuable memory of the event. Lots of scenes to choose from. Photos can be presented in various sizes, within a designer sleeve, frame or on various accessories such as key rings, lockets, calenders etc if required. Measuring over 3 metres tall these candy canes make an All-Day Sucker seem tiny. 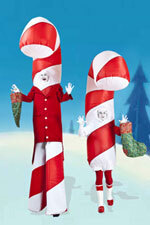 These chatty, cheeky Candy Canes will draw people in to your X-Mas event and leave them with a sugar high!. The Candy Canes also distribute lolly candy canes to the audience (optional) or you may prefer to have customised rock candy commissioned with your company name or logo. 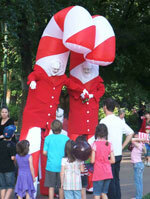 The Candy Canes can perform both indoors and outdoors; from shopping centers to parks and gardens. If you want your event to stand out, these canes are your candy-men. Leonnie is a sought after Actor and MC with many TV roles behind her. Leonnie has a great demanding presence and is very witty. Each PROMOTOMOBILE is equipped with a battery operated, multi-function PA system that plays bright, appropriate ‘toe-tapping’ music. But also allows: Advertising theme music, Operator spruiking , Individual organisation promotional messaging. Promotomobiles fully understand the value of providing innovation and fun when promoting within shopping centres and will work wi th Centre Management to provide extras such as activities and give-a-ways. Promotomobiles provide a promotional package that is colourful, engaging and fun, but has the serious core function of effectively meeting Retailer’s or Centre Management’s promotional needs. Singing medleys from various popular tunes, the Divas incorporate aspects of your company into each performance. Divas is a highly entertaining 15 min performance, with fully harmonised singing, professional backing tracks, full costumes and a humorous A/V presentation if requested. Add fun, motivation and energy into your next conference, gala night, training or function. Julienne and Deanna , both wonderful performers in their own right, have come together to create the highlight of your corporate gala. They will get to know the main aspects of your business, the products and key personnel, and incorporate them into their act – personalising each performance to your specific company and event. This unique and highly entertaining performance will be what everyone will come away talking about!. Harmonised singing, dancing and comic acting. A 15 min comic performance relating to the specifics of each company. They write, choreograph, design and perform each act. Leave them laughing in the aisles. An unforgettable performance – the highlight of your event. Show : Chicago Tommy Magic and Mentalism: Cutting edge magic, sleight of hand and mind illusions. 45min/1hr Suitable for: Private functions and parties, social events, corporate dinners, golf outings, country clubs, fund raisers, college shows, comedy clubs. Show type: Trade show booth: 5 to 10 minute spots throughout the day of trade show. Suitable for: Creating product awareness and attracting attention to booth. Technical rider: Area facing trade show traffic. Performer supplies sound system. Show Type: Walk Around: Max 3 hrs roving magic and mentalism. Suitable for: Large functions. Outdoor events, indoor events, events where the focus is on people at the tables getting time to interact with each other, therefore a stage show is less desirable. Technical Rider: Performer supplies everything. The unique retro styled Rocket is an imposing, free-standing installation with inbuilt audio-visual capabilities, ideal for showcasing promotional DVD’s. Standing three meters high and visually striking, The Rocket is one of a kind, custom-built and perfect as a promotional centre piece or as a feature installation for many different event applications. In addition to twin monitors and DVD playback, The Rocket can also be loaded with gaming systems, making it a great addition to children’s parties and youth events. Other features include contoured programmable LED’s and a Smoking Launch Preparation, adding to the sensory impact and overall style of The Rocket’s classic design. 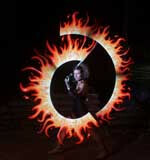 If you wish to make a firey display to compliment rocket we have fireworks performers to accompany display.